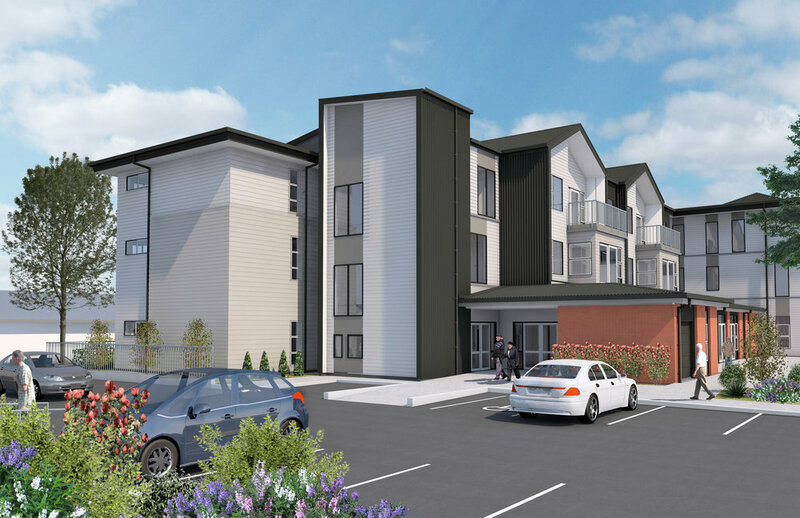 Work is underway on a new three level 50 apartment complex for BUPA Healthcare, as they expand their existing facilities at their Fergusson Drive site in Upper Hutt. The construction team, lead by Maycroft Construction, is currently completing work to the structural frame of of the whole complex. In the coming months they will be progressing with the next stage of cladding the buildings. The apartments will offer independent apartment living adjacent to the existing care facility environment. Most are two bedroom and open on to sunny balconies with great views over the northern Hutt Valley. Ground floor community and social facilities open on to a generous landscaped enclosed courtyard. BUPA have shown a strong future-focused approach in committing to the quality of these facilities. This has included seeking a Homestar 6-Star accreditation for the development. Homestar is a sustainable rating tool run by the New Zealand Green Building Council. Completion is scheduled for late 2019. The new complex will provide comfortable attractive modern accommodation in a sector where demand continues to outstrip supply.